Provincial governments have responsibility for delivering most of Canada’s important social programs, whereas the federal government has the discretion to pick and choose how much it wants to spend to support them at any given time. This results in a fundamental imbalance in the amount of “fiscal risk” federal and provincial governments are exposed to. Fiscal risk is a measure of the degree to which government has control over a specific area of spending; more control over programmatic spending equals less risk, and vice versa. 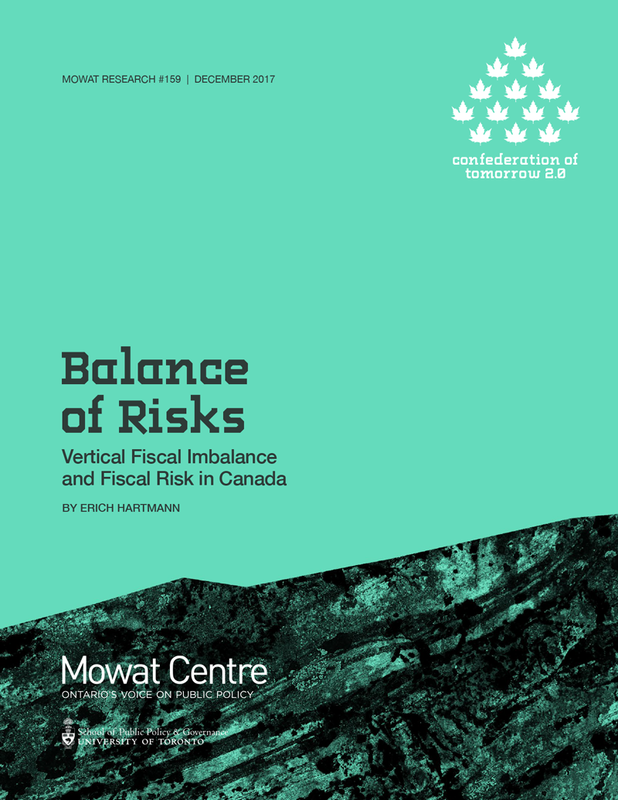 The imbalance in fiscal risk between Canada’s orders of government is a significant contributor to fiscal imbalance in Canada. Furthermore, provinces are more fiscally vulnerable to localized economic shocks, which in turn can frustrate their ability to deliver the open-ended programs that they are responsible for. This imbalance represents an opportunity as much as it poses a challenge. The federal government can leverage its lower exposure to risk to make Canada as a whole more fiscally sustainable and resilient. Reforming federal transfers to the provinces to better reflect the fiscal risk that comes with Canada’s important social programs will be a critically important step in addressing the Vertical Fiscal Imbalance. The provinces’ greater exposure to fiscal risk and vulnerability to short-term economic risk can be addressed through relatively simple reforms to Canada’s fiscal stabilization and fiscal stimulus mechanisms. These reforms would affect a better sharing of both short-term economic risk and the structural allocation of fiscal risk in the federation. The institution of federalism has many functions but at its core, it is a mechanism for dividing up responsibilities between orders of government. Canada’s federal system, however, has departed a long way from the era of watertight compartments, when each government carried out its taxing and spending decisions independently in its own closely-guarded jurisdictions. Instead, Canada’s federal and provincial governments are deeply entangled and share a considerable amount of policy space. While this has led to a much more complex system of governance, this intergovernmental entanglement has given rise to countless positive outcomes including important social programs. Despite this trend towards increased entanglement, there is still considerable separation in the degree to which the federal and provincial governments are exposed to the “fiscal risk” of delivering these programs. Fiscal risk, as it will be discussed in this paper, is a measure of the degree to which government has control over a specific area of spending; more control over programmatic spending equals less risk, and vice versa. Provinces have responsibility for delivering most of Canada’s important open-ended programs – including healthcare, social services and education – which are subject to significant demographic pressure and citizen demand. The pressures associated with these programs are only projected to mount. An aging population, for example, will strain the health care system and the increasing demand for an innovative workforce will highlight the value of education systems across the country. Provinces will face the choice to either meet these demands, or risk the alternatives. A considerable degree of provinces’ fiscal risk profile then is structural in nature. The federal government, however, has managed to insulate itself from much of this fiscal risk, reserving for itself a considerable degree of control over its budget. Because much of the federal government’s spending profile is discretionary in nature – including federal transfers for healthcare, social services and post-secondary education – it can pick and choose the degree to which it is exposed to fiscal risk. Furthermore, while provinces have access to a broad array of revenue streams, their tax bases are by less diversified than that of the federal government which applies its tax rates across the entire country. Provinces then, are more fiscally vulnerable to localized economic shocks, which in turn can frustrate their ability to deliver the open-ended programs for which they are responsible. Canada’s fiscal federalism frameworks do not perform particularly well at sharing either the short-term or structural fiscal risks associated with delivering its vital public programs. The implications of this problem are not restricted to theorists or public finance specialists either. Failure to address the asymmetry in the allocation of fiscal risk between the two orders of government means that Canadians will not get enough of the services they want and need and too much of the public debt that they do not. Fiscal federalism, therefore, should be reformed to better share fiscal risk. This process need not involve a fundamental rewriting of the Constitution. Modest and immediately implementable changes to Canada’s regime of intergovernmental transfers can be made to better balance the allocation of fiscal risk between the orders of government over the long term.